I’m a big proponent of questions. Asking the right questions has the power to move your business forward in ways that no amount of having all the right answers ever will. I’ve been imploring small business owners to ask every customer a handful of specific questions for many years now. It’s very tempting these days to turn to Google for answers to most every business question, but sometimes the only way to get meaningful answers to life’s most important questions is to sit in front of another real human being and pay attention to what you ask and how they respond. The real value in systematically posing questions in this intentional way is that it often evokes answers that make us think, give us insight, and provide us an opportunity to hear stories that draw us closer to the people we’ve queried. Questioning is an art more than anything else and the real gems in terms of answers come when you have the courage to ask what I call the question inside the question. The question inside the question is a layering of sorts that allows you to pass through the obvious surface to where something much more useful and perhaps even magical can occur. 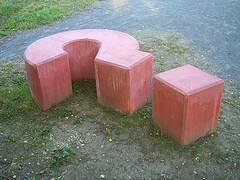 Below are three varieties of powerful questions inside the questions. The problem with this answer is that while good service is, well, good, the answer by itself isn’t very helpful really because who doesn’t claim to provide good service. To stop at this level of answer is to miss the opportunity to get into the mind of your customer. The evolving question inside this question then is – can you tell me a story about a time when we provided good service? This question allows you to get at something terribly specific that just might provide you with a way to describe your value proposition in terms of something that actually matters to your market. One the hardest jobs marketers have is to understand and then articulate the things prospects don’t know they don’t know. This is a subtle art because the only real signals we receive come in form of questions that prospects ask or what many marketers call FAQs or frequently asked questions. The art is in this question inside the question is in understanding the things that should be asked, but aren’t. I’ve gone as far as calling these frequently unasked questions or FUQs. I’ve been interviewing authors and thought leaders on a weekly basis for years now and I’ve asked my share of generic questions that have elicited equally generic answers. What I love are those moments when I hit on a question that makes my guest light up and offer an unexpected, but totally authentic answer. Ann Handley of Marketing Profs shared a great example of this approach with me recently. Instead of asking “What’s your book about?” Ask “What did you leave out of your book that you wish you put in? This approach is a tremendous way to ask questions that are thoughtful and allow you to gain immediate rapport, deeper engagement and equally thoughtful replies. You know you’re on the right track in this line of question inside the question when people occasionally stop and smile before they answer because you’ve asked something they’ve always wanted to answer but no one bothered to ask.